Well, Hello there stranger! Repost of Stroganoff with Meatballs! How have you been? It’s been a crazy few months in our home. I’ll catch you up – girls basketball season is over – yay! My husband is home recovering from back surgery (spinal fusion) that he had earlier this month. This is his fourth back surgery and we are hopeful that he will get some relief. And one more thing, this momma went back to work! I am now working part time in a school as a Migrant Tutor. I assist two students who qualify for the Migrant Education Program. The hours and days are perfect so I can still hold down my other full time job as Mommy Taxi Cab taking the kids to school, picking them up and shuffling them off to all their little sports and activities throughout the week. It feels good to be back in a school (and it’s a wonderful school) and getting some use out of that dusty old education degree! There’s still a little adjustment to my daily routine, switching from workout clothes and bed hair to looking presentable in the morning and having the girls help out more with chores at home. I think you are all up to speed. So please pardon my absence. Things just got a little crazy and I’m still learning how to be a little better with managing my time. The not so fun household tasks, cooking and cleaning, errand running and hitting the pillow a little earlier all have taken their toll on my blog writing. I’ve had so many posts written in my head, in my crazy NyQuil induced dreams, and funny things that I’ve wanted to share with you over the last month, but I just never got around to writing them. I actually did begin writing a post while my husband was in the hospital after his surgery, but then I never finished it, never published it and am moving on. I just completed a six week fitness challenge at my favorite hang out spot – my local YMCA. The challenged wrapped up today, yes just after Thanksgiving and encouraged everyone to participate in the annual Thanksgiving Day Run. It was a great motivation to move more, open up your fitness comfort zone to take new classes and try new activities at the Y. As always, my struggle was not with the working out – but with the eating better. But the mindset of starting now (or six weeks ago) is much more proactive than procrastinating or telling yourself that you’ll start after the holidays. So hopefully my stubborn, food loving body did take away something from the challenge and it will help carry me through to make better choices throughout the holidays and thereafter. At any rate – I love a challenge so here’s to the next one! As a celebration of the end of the challenge – I made one of my favorite dishes last night. I’ve posted it before, but I thought I’d repost because it’s just so good. Ok, it’s pasta. And pasta is not the best for my healthy eating, but hear me out here. It’s only the second time this month that I’ve eaten pasta. (Well, in chicken noodle soup when you’re sick doesn’t really count!) I made spaghetti and meatballs the night before my husband’s surgery as a last supper type meal since he wouldn’t eat again for 4 days. No joke. I didn’t have any leftovers and didn’t eat any pasta since then so last night was quite a treat and I think it was well deserved. I paired it with a big old spinach salad so that helps my case too. 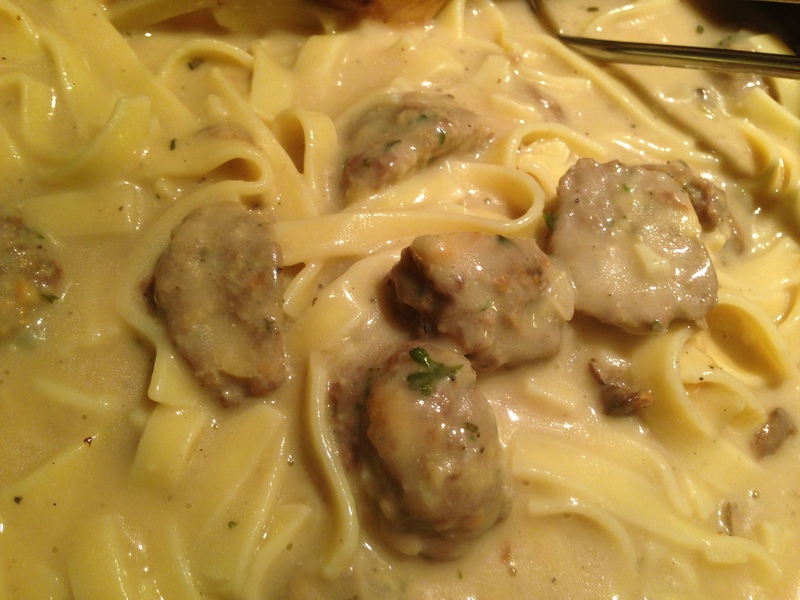 So here’s the recipe and part of that original post for my Stroganoff with Meatballs. My original post didn’t include a handy dandy printable recipe page so I’ve included that below. Give this one a try. Or better yet – make a big ole batch of meatballs and freeze half of them so you can make this dish tonight and spaghetti and meatballs in a few weeks so your pasta quota is filled (bellies are happy) and those carbs are adequately spaced out. Homemade Meatballs that were cooked, frozen and I let defrost for a few hours. I cut them in half. Getting the sauce to just the right consistency. Adding in rosemary. I chopped a little off of a sprig that I had frozen. Chopped Rosemary. I love that smell. Finishing off the sauce with a touch of fresh ground nutmeg. Garlic bread on the side. 20 meatballs – cooked. Either fresh cooked, or thawed if frozen, but they don’t have to be hot since they will warm up in the sauce. 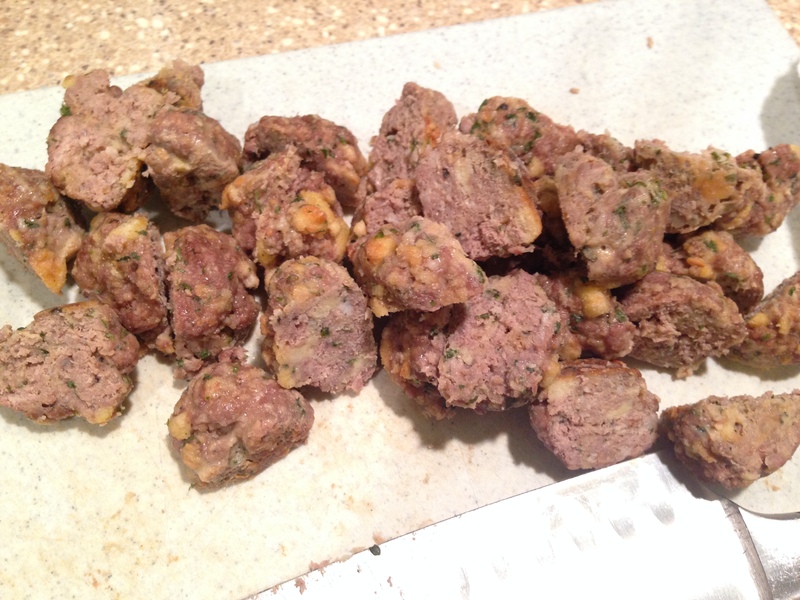 I cut my 20 thawed meatballs in half. See below for my meatball recipe. 1 lb pasta. Any will work. 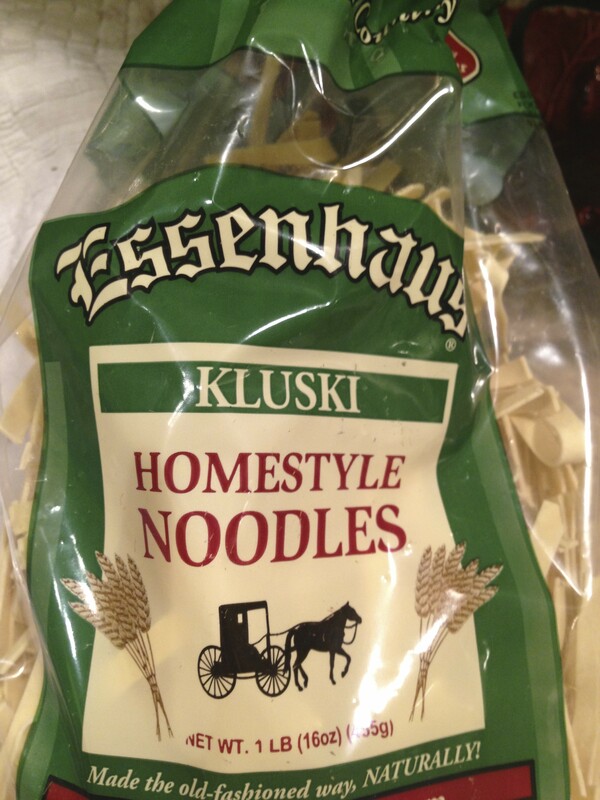 I used dry medium Amish style noodles. My second choice would be a fettuccini noodle. 1/2 C fresh or canned sliced mushrooms – chopped. I used fresh mushrooms that had been frozen. 1/8 C heavy cream. I used 2 cubes of frozen heavy cream. 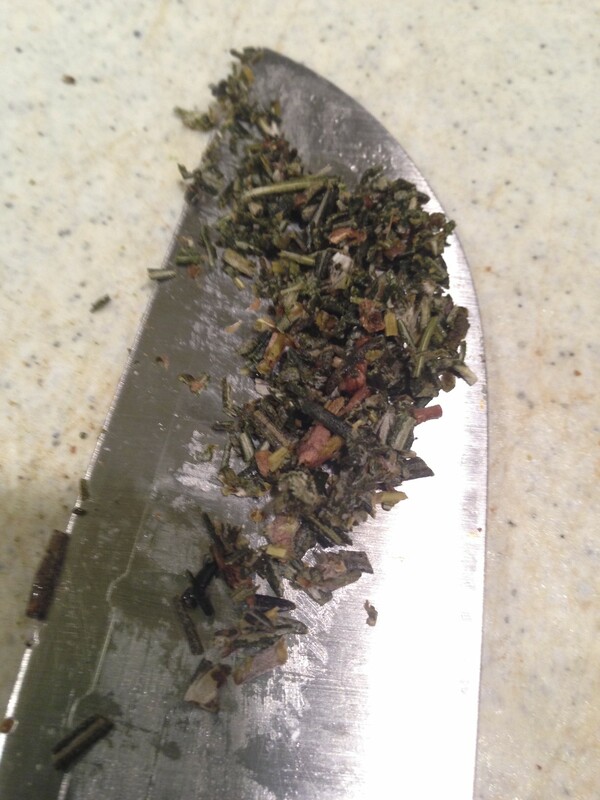 1 teas rosemary chopped. I chopped some off a frozen sprig I had in my freezer. a half a pinch of nutmeg. Remember that Nutmeg has a pretty intense flavor. I used a tiny bit of fresh grated. Melt butter in a large, heavy pot and add diced onion. Saute over medium heat until onion is soft. Add in garlic and stir over medium heat for just a minute. 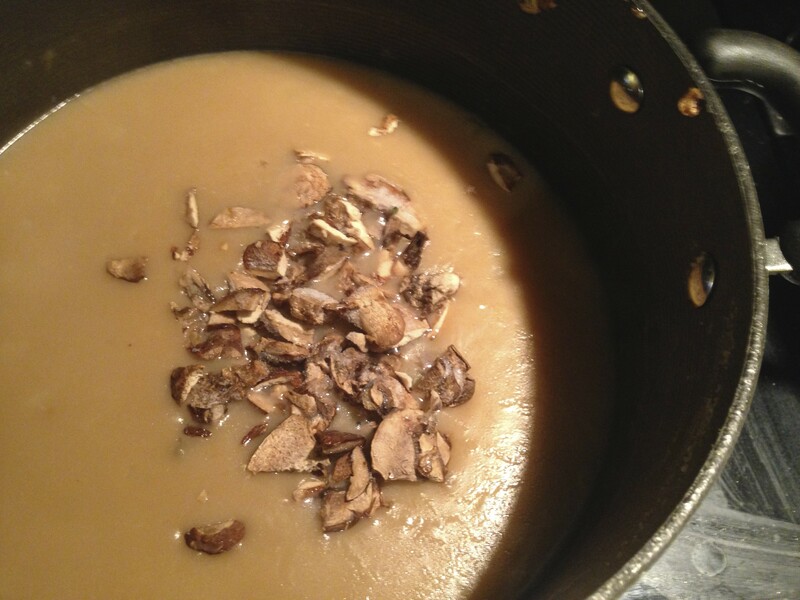 Add in flour and stir with the melted butter, onions, and garlic to create a thick roux. Continue to cook your roux for a few minutes until it becomes a nice golden color. Add in the beef soup base or bullion cube and water mixture. Stir over medium heat and the sauce will thicken up until it coats the back of a spoon. Add in the Sour Cream and heavy cream. Add in the mushrooms, rosemary, nutmeg, salt and pepper. Keep the sauce on medium heat making sure the sour cream is all mixed thoroughly and heavy cream is incorporated (making sure cubes are melted if using frozen cream cubes). Carefully add the meatballs to the sauce and make sure they are submerged so they warm up. I let mine thaw in the fridge for a few hours prior to making this meal. 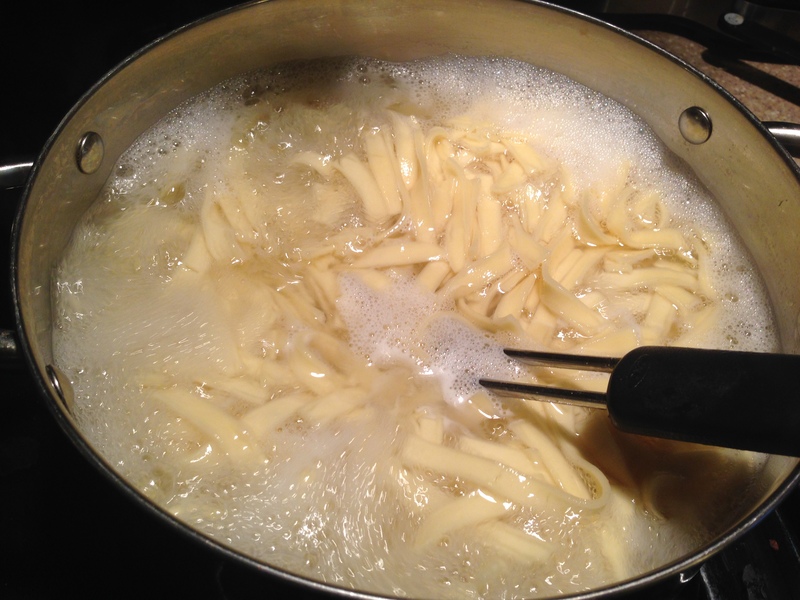 Bring a large pot of water to a boil, add 1/2 teas of salt to the boiling water and add your pasta. Boil pasta per package directions. I boiled the Amish style noodles for around 12 minutes, added around 1/2 C of pasta water to my Stroganoff sauce and then I strained the pasta and added the pasta to the Stroganoff sauce with meatballs. Carefully mix the noodles in to make sure they are covered with sauce and mingling with the meatballs. I let it cook on low for a few more minutes while I finished up the bread. 2- 2 1/2 C breadcrumbs. I use about a half a loaf of Jimmy John’s day old bread and pulse it in food processor. 1/2 C grated parmesan or romano cheese. I use 1/4 C of each. Roll up those sleeves and wash those hands – you’re going to need them. Prepare Breadcrumbs in food processor and set aside. In a large bowl, combine ground beef and sausage. Gently work until combined. Add in breadcrumbs, eggs, cheese, parsley, salt and pepper and mix until combined, but do not over work. 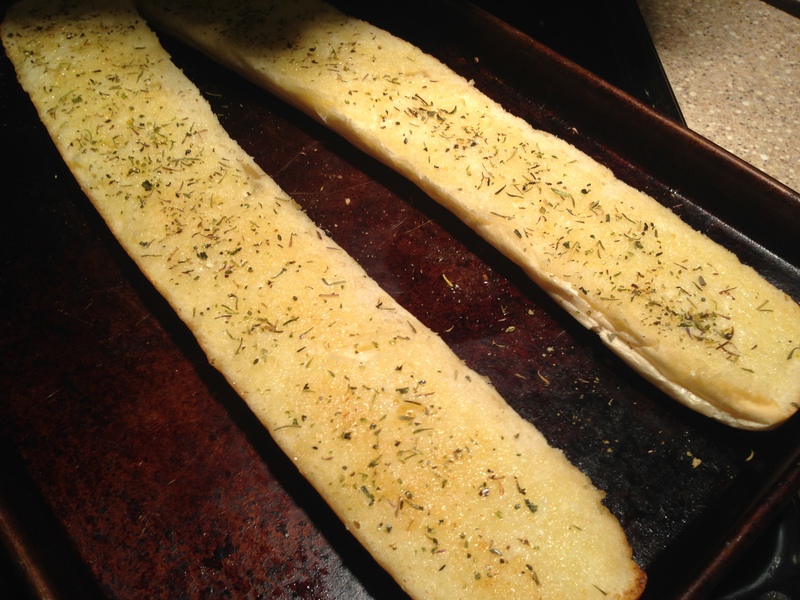 Place evenly spaced on baking sheet and bake at 350 Degrees for 20 minutes. Once the meatballs are cooked, remove from oven, but keep the meatballs on the baking sheets. This will make around 55-60 golf ball sized meatballs. Take half of them and set aside until your sauce is ready. Keep the other remaining half of the meatballs on the baking sheet and place in deep freezer for an hour or so and then transfer to a large freezer bag and return to the freezer. When you are ready to use the frozen meatballs, just take them straight from the freezer and put them in hot sauce until heated through. Or let them defrost a bit if you need to cut them in half. You can also heat in crock pot but I would try to avoid heating in oven since this may cause them to over cook and dry out. And there you have it. A lovely little dish that utilizes those delicious homemade frozen meatballs and is very easy to throw together. Here’s a few ways, I was able to speed up my prep time for this dish. You’ve probably noticed, I freeze a lot of things. 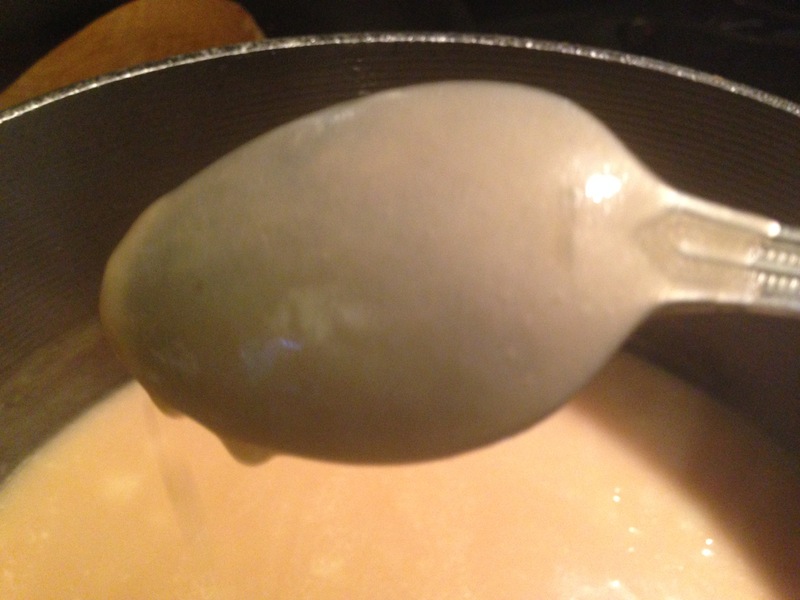 I freeze heavy cream in ice cube trays and then store in the freezer in freezer bags for easy use in sauces and soups. I also freeze fresh herbs like rosemary. 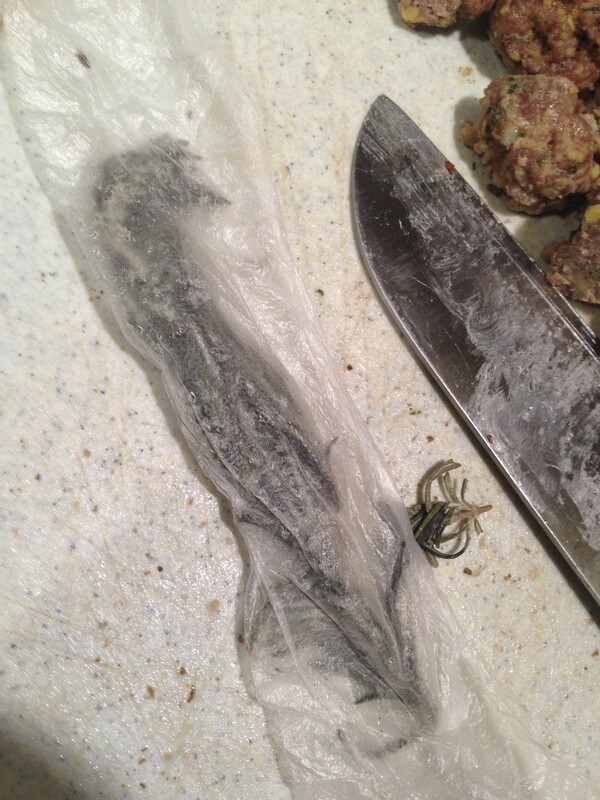 I just wrap the whole sprig up in Press and Seal. I take what I need and add the whole sprig to the sauce for flavor and remove it out before serving, or I chop up the frozen sprig and add the chopped rosemary to whatever I’m cooking. I also usually have diced onion frozen in Press and Seal and in freezer bags and ready to be thrown into anything I’m making. For this dish, I’ve used up some fresh sliced mushrooms that I had frozen. I just chopped them up straight out of the freezer and threw them into the sauce. These little time savers really allow me to make some yummy meals that have lots of ingredients fairly quickly. I said earlier that I made some garlic bread to go along with this dish. It was just a loaf of day old Jimmy John’s bread that I sliced in half and my daughter melted some butter and spooned it on, then we added garlic powder, and some Italian seasoning to it. Baked it in the oven at 425 degrees for around 3-5 minutes, slice it up, and it’s ready to compliment any dish. Click HERE for more ways you can utilize Jimmy John’s Bread. Help is on the way! Fixing shrunken clothes! Chicken Pot Pie Soup – bring on the snow! Hey Christy. Good luck with your new job. Thanks for this stroganoff recipe. 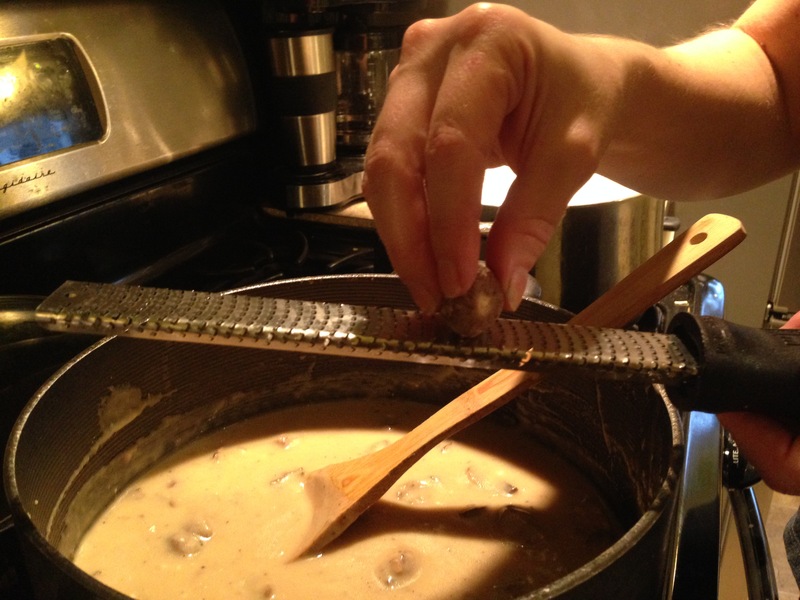 I used to make stroganoff regularly but lost my recipe over the years. Yours sounds good. Can’t wait to try it!